Team Designs Pty Ltd. 5/27 Jacaranda Drive Carrum Downs VIC 3201 Melbourne, Australia. 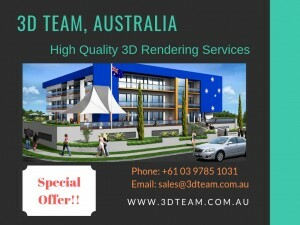 3D Team specializes in 3D rendering like Architectural, Interior, Product, Industrial and Animation with latest technology and software to give the photo realistic 3D rendering services in Australia. 3D rendering examples the creation of an idea requested by a client it may be a real-world object or an imaginary that represented in a sketch say, interior design or products.